Walking can be an effective way to burn calories and can help you manage your weight. It's important to establish an active lifestyle during weight loss because regular physical activity is a primary factor in weight maintenance. An hour long daily walk, in combination with a healthy diet, can help you reach your weight goals. You lose weight when you burn more calories than you consume. The primary factors in weight loss are diet and activity level. If you increase the amount of time you spend exercising and maintain your normal caloric intake, you're likely to experience a modest amount of weight loss. Weight loss requires a higher amount of activity than weight maintenance. Walking at a speed of 3.5 mph is considered a moderate-intensity activity, according to the Centers for Disease Control and Prevention. 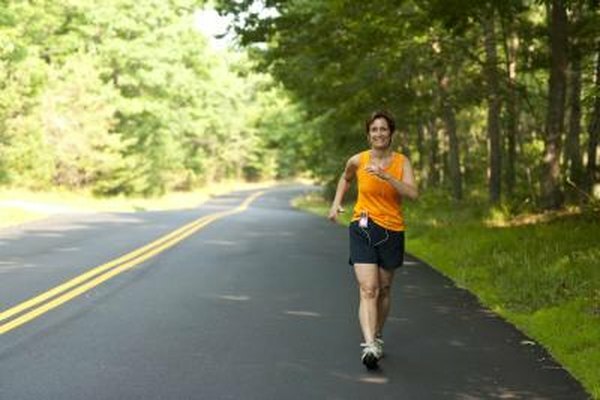 If you're power walking at a speed of at least 4.5 mph, you're getting a vigorous-intensity workout and are burning more calories. Walking at moderate intensity for an hour a day burns approximately 280 calories in a 154-pound person. An hour's walk at vigorous intensity burns an estimated 460 calories. As long as you don't increase your caloric intake, a moderate daily walk produces a weekly deficit of approximately 1,960 calories, and a more vigorous walking routine leads to a deficit of 3,220 calories. You can use the American Council on Exercise physical activity calculator to get a personalized estimate of calories burned during walking. You need to establish a 3,500-calorie deficit to lose a pound of body fat. Depending on the intensity of your workouts, you can lose 2.2 to 3.7 pounds in a month by walking for an hour a day. If you increase the duration of your workouts or take days off, the potential for weight loss adjusts accordingly. Altering eating habits accounts for most weight loss, according to the CDC. However, exercise can help you reach your weight goals if you stay consistent and monitor your food intake. If you change your diet to reduce your caloric intake, you can boost your weight loss efforts. Aim for a maximum loss of 2 pounds per week to improve your chances of maintaining your weight loss over time.